Gino Odjick surprised a large group of people attending a ceremony to rename an arena in his hometown of Maniwaki, Quebec on Saturday. The arena has been renamed the “Centre Sportif Gino-Odjick”. Because of a rare heart disease Odjick has been told by doctors that he may have only weeks or months left to live. Odjick has been transferred to a hospital in Ottawa, located approximately 130 km away from Maniwaki. When the Town of Maniwaki announced the decision to rename the arena in Gino’s honour, it was speculated that Odjick would provide those in attendance with a video message. Odjick not only found the strength to attend the ceremony, but also to pose for pictures, speak to the crowd and even speak to the media in attendance. It should surprise nobody that Odjick took the extra time and effort to attend the ceremony as he has always had a great relationship with his fans and has always had a great sense of responsibility to First Nations communities. 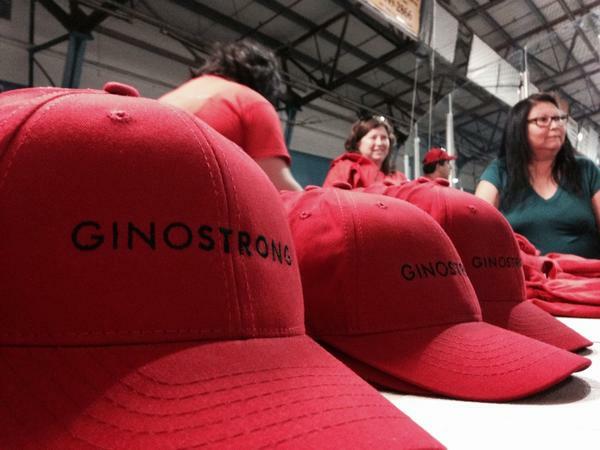 Many of those in attendance were wearing “Gino Strong” hats and t-shirts, while Gino told media in attendance that he plans to fight the disease and live for at least ten more years. While Gino appears physically weakened from the disease (video is available in French on Radio-Canada’s website), his spirit appears as strong as ever. Gino told reporters (translated from his French language interview with Radio-Canada): “It’s special to be honored like this and to have an arena named after me. I am very happy”. More from Gino: “I’m lucky, I have good treatments. I was told that all things are improving, I’m happy. We will fight to try to heal”.